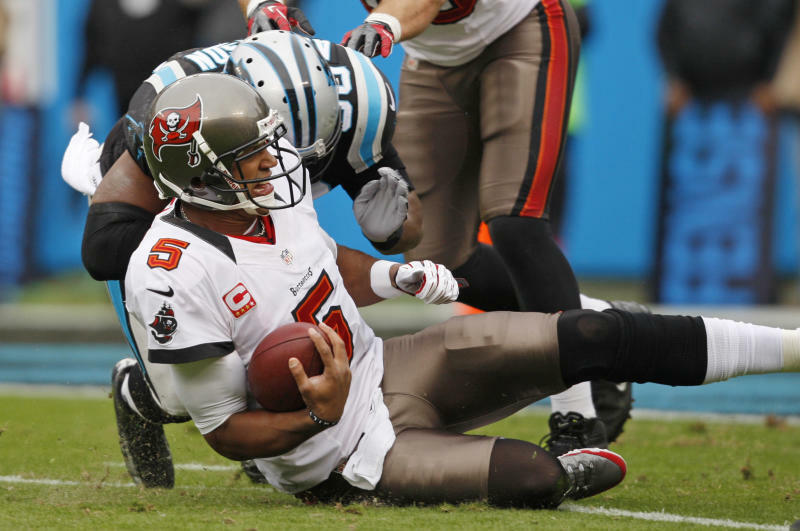 CHARLOTTE, N.C. (AP) — The Tampa Bay Buccaneers are starting to look and talk like a legitimate playoff contender. 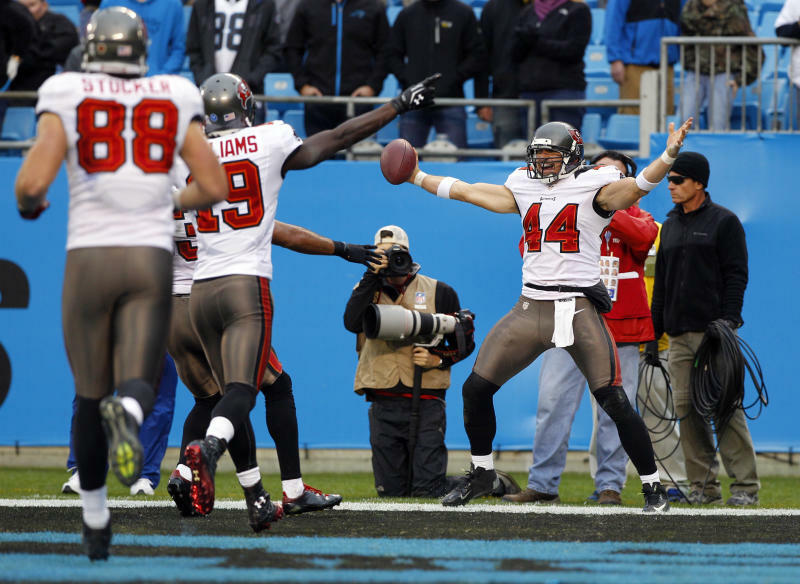 The Bucs had to work a little extra to keep their playoff surge alive Sunday. Josh Freeman threw a 15-yard touchdown pass to Dallas Clark in overtime to cap the Buccaneers' 27-21 comeback win over the Carolina Panthers. It was Freeman's third touchdown pass of the game for the Bucs (6-4), who have won five of their last six to pull into playoff contention. "We learned a lesson today that we can't just show up and win a game," Clark said. "I hope guys will get it. We're lucky it's not a loss. I hope we go back and look at the film and say, 'Hey we didn't play well.' Sure, we played well enough to make some plays to win at the end, but to get where we want to go, that's not good enough football." Meanwhile, the Panthers (2-8) would love to have a win any way they can get it. Carolina has lost seven of its last eight. The Panthers held a fourth-quarter lead in five of their last six defeats before fading in the final seconds. "It's been the story of our season," said Cam Newton, who threw for 252 yards and a touchdown to fall to 8-18 as an NFL starter. When asked where this loss ranked among this season's meltdowns, Newton snapped, "I'm not answering no more questions about where this one ranks." Carolina appeared to have the game in hand when Newton connected on a 29-yard touchdown strike to Brandon LaFell to go up 21-10 with six minutes left in regulation. But after a 40-yard field goal by Connor Barth, the Panthers' offense couldn't put the game away and had to punt. "You've got to love it when the linebacker swears as you're heading up field," Clark said with a laugh. Freeman said it was a play the Bucs worked on all week and he's glad that was the call. "When we got to overtime we stepped into the huddle and everybody was ready to go and we started talking like, 'Hey let's just execute one play at a time and do our jobs and try to get out of this thing with a touchdown,'" Freeman said. But after Tampa Bay jumped to a 10-0 lead the Panthers' defense shut them down for most of the remainder of the three quarters, forcing three turnovers. A 74-yard interception return for a touchdown by Captain Munnerlyn and a key fumble by rookie Doug Martin on a fourth-and-goal at the 1-yard line loomed large. But on fourth down, coach Greg Schiano went for the touchdown instead of the field goal and linebacker Davis plowed into Martin, forcing the ball out near the goal line. Fellow linebacker Luke Kuechly, the team's first-round draft pick, recovered in the end zone for a touchback. But once again, the Panthers couldn't finish. Second-year coach Ron Rivera, whose seat only grew hotter after the loss, said the game was all about missed opportunities. Rivera said the loss "is right up there at the top" in terms of toughest ones to swallow. "This is about as bad as it gets," he said. "The bad part is when you have opportunities to close someone out with a four-minute offense, but you can't take negative plays. That's a tough one." NOTES: Freeman has now thrown 16 touchdown passes in the last six games. ... Wide receiver Steve Smith injured his hand and defensive end Charles Johnson his head during the game, but both returned. ... Martin had 138 yards rushing for the Bucs. ... Carolina had 97 yards rushing after being held to 10 in the last meeting with the Bucs in the season opener.